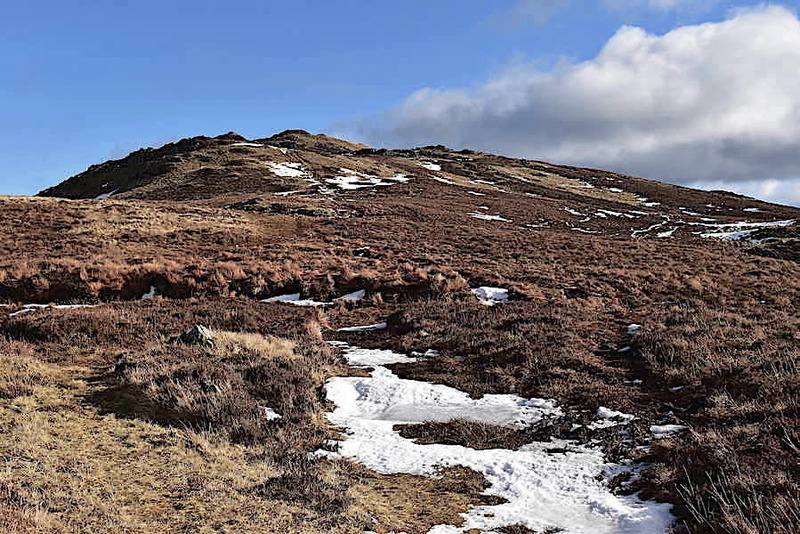 Just as it was with our last walk on Gowbarrow, today’s walk was a last minute decision, based on a slightly better weather forecast last night than had previously been indicated. The weather is all over the place at the moment and the forecasts seems to change from hour to hour. 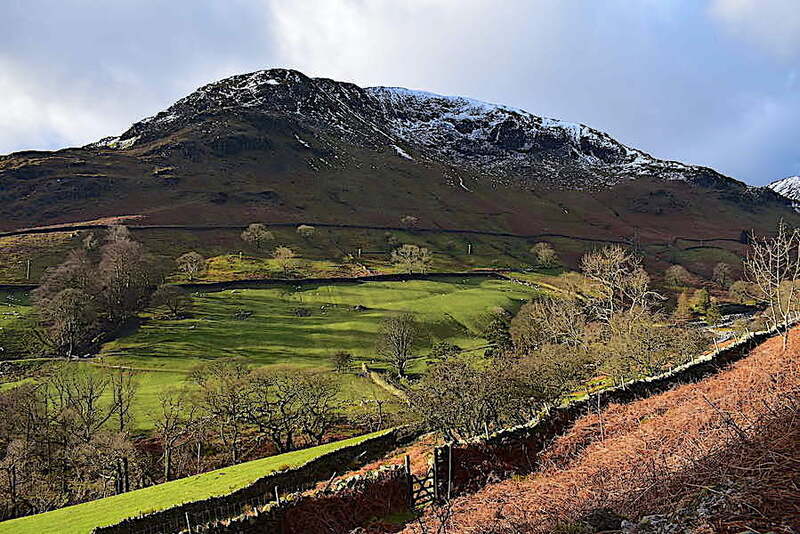 So on the basis that the day would be very windy but mainly dry with some sunny spells, although there could be the odd shower anywhere and anytime, off we went to Glenridding for today’s short walk up to Sheffield Pike and Glenridding Dodd. I noticed a large sign, fixed to the wall of the toilets in the car park, to the effect that the charge for using them is now 30p. I used to grumble about the old penny in the slot charge so you can imagine how I feel about that. I’d better stop now before my high horse gets any higher. 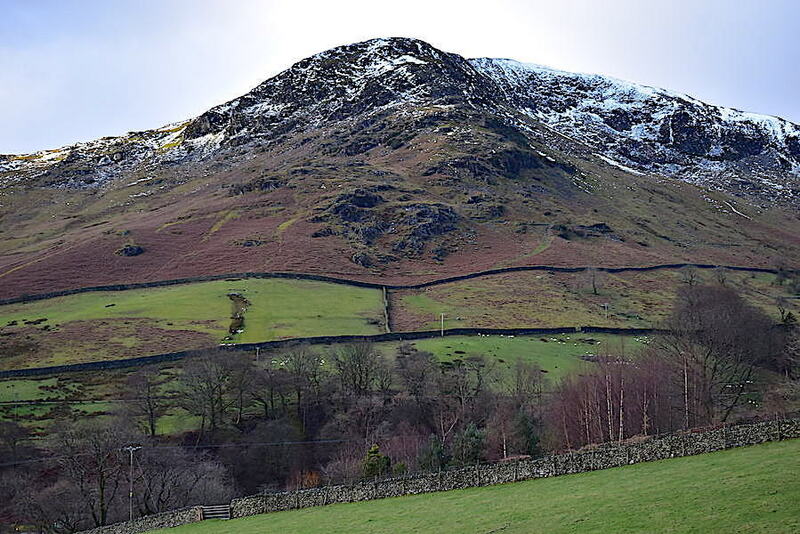 Heron Pike and Glenridding Dodd under cloudy skies as we walk up the Greenside Road. The morning was due to start cloudy and then gradually brighten up later on so the first part of the forecast is spot on, we’ll wait and see what happens about the second part. 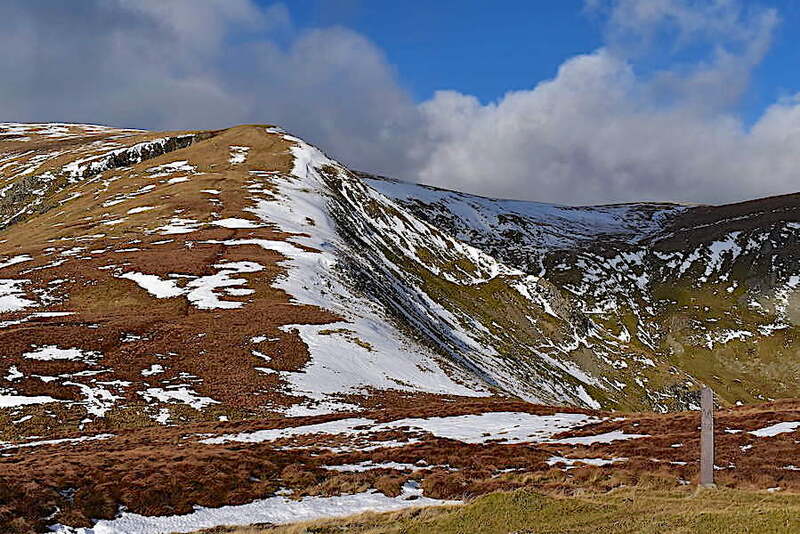 When we left home the temperature was +5C so the mercury has risen considerably since our last walk up to Gowbarrow, and its mild enough for my jacket to be left unzipped. 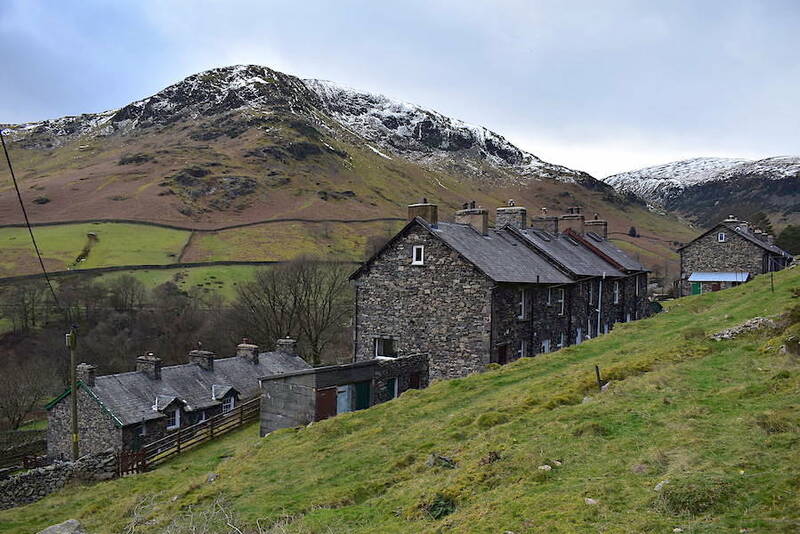 Everything was very quiet in Glenridding with hardly anyone around, only a handful of cars in the car park and no walkers to be seen anywhere as we head up the hill and take the right hand turning up to the former miners cottages, heading for the former Greenside mine. 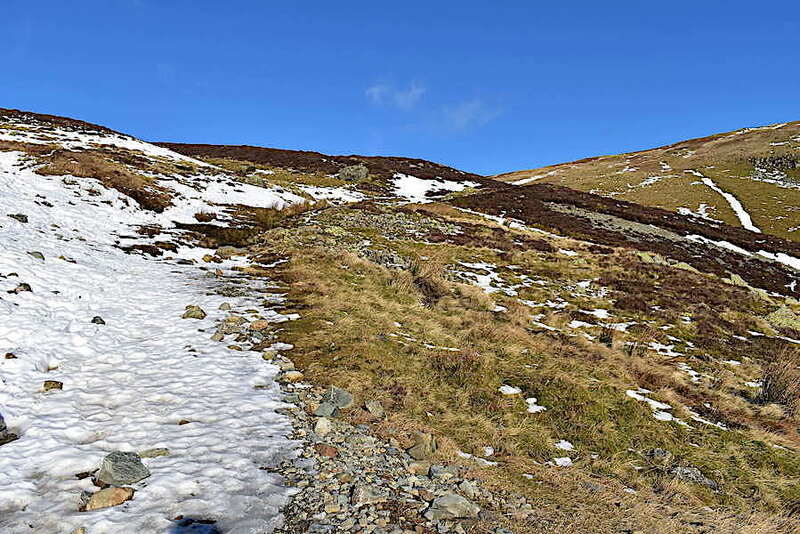 The left hand turning …..
….. leads down to Rattlebeck Bridge and eventually on to the Mires Beck path up to Birkhouse Moor, from which a good deal of the snow has already melted away. The hint of sun on the fields below it seems to hold the promise of better things to come as gaps begin to appear in the cloud layer. Birkhouse Moor again as we continue up the Greenside Road …..
….. and just a little further along another burst of sunlight pierces the cloud, and the fields across the valley glow emerald green. I love the way the light creates such brief, but very intense, colours as the clouds scud along, and speaking of colour, in the top right hand corner blue sky is beginning to appear so perhaps part two of the forecast is going to occur. 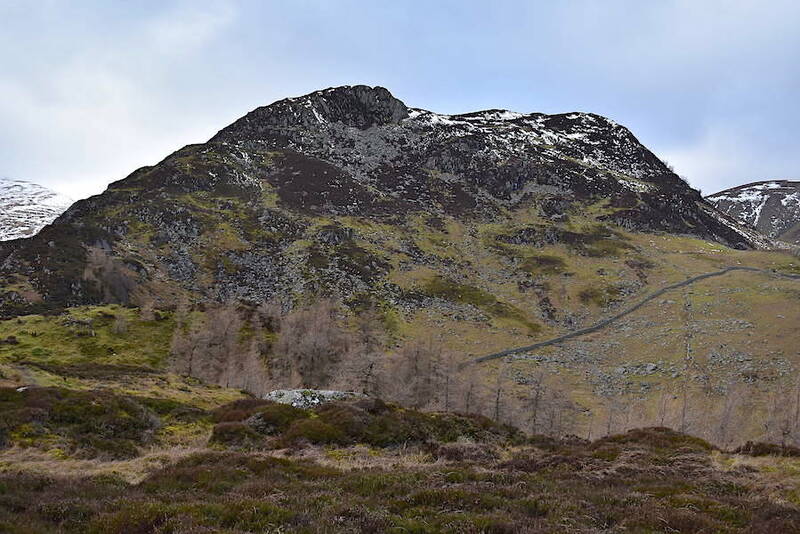 Anyone who has walked up the Greenside Road will know that it has a long steady incline, rather than being in your face steep, and its not the sort of climb that has you gulping for air. Things were a little different today though because the wind was coming straight at us, and at a strong speed too, so making decent progress up here became quite a battle and on three occasions it was strong enough to knock the breath out of me, and to bring me to a momentary halt, as I battled my way through it. On the plus side though it was coming from the west so wind chill wasn’t a factor today. We gained a little respite from the wind, in the shelter of the mine buildings, so we took a moment just to get our breath back and view the melt water flowing thunderously down Swart Beck. 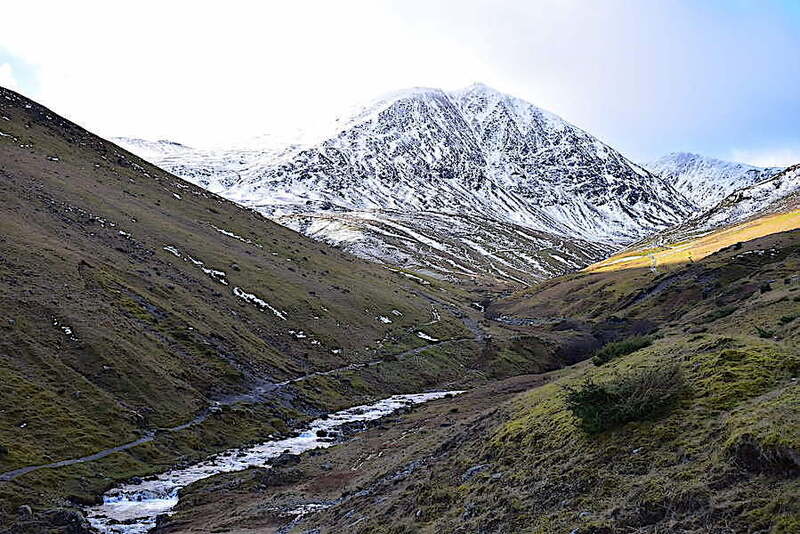 We leave the main path and turn up to the right, heading for the zig-zag route around Stang End above the old mine workings, with a close-up view of Catstycam to our left. 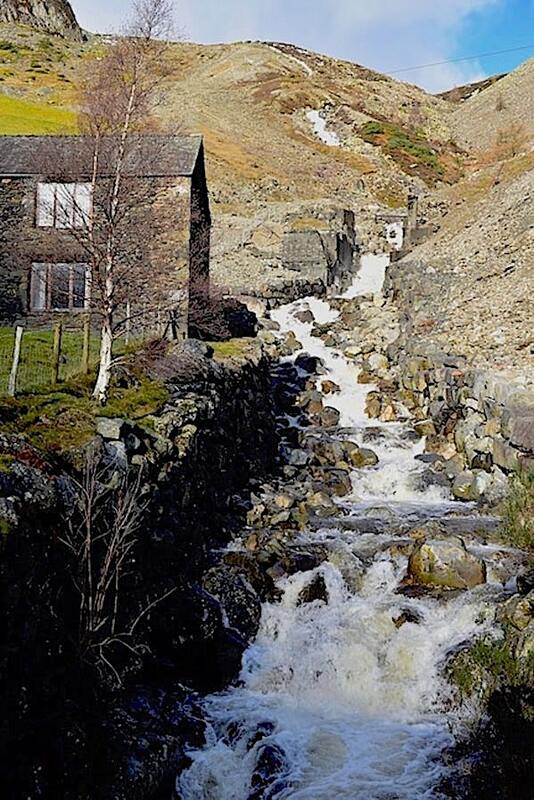 Glenridding Beck is also full of melt water and fast flowing. 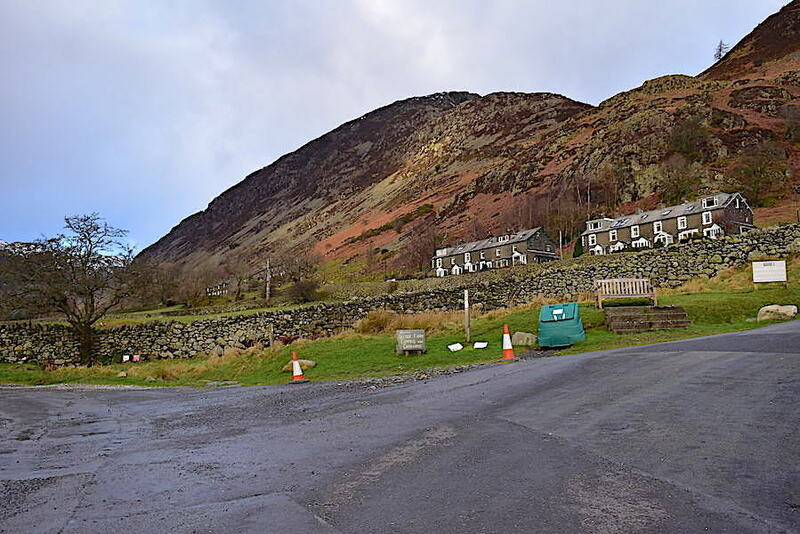 Birkhouse Moor is casting its shadow over us at the moment …..
….. but the longer view shows the cloud breaking up very nicely so it won’t be long before we have some sunnier walking to look forward to, for now though we are still battling the strong wind which is coming at us full in the face. 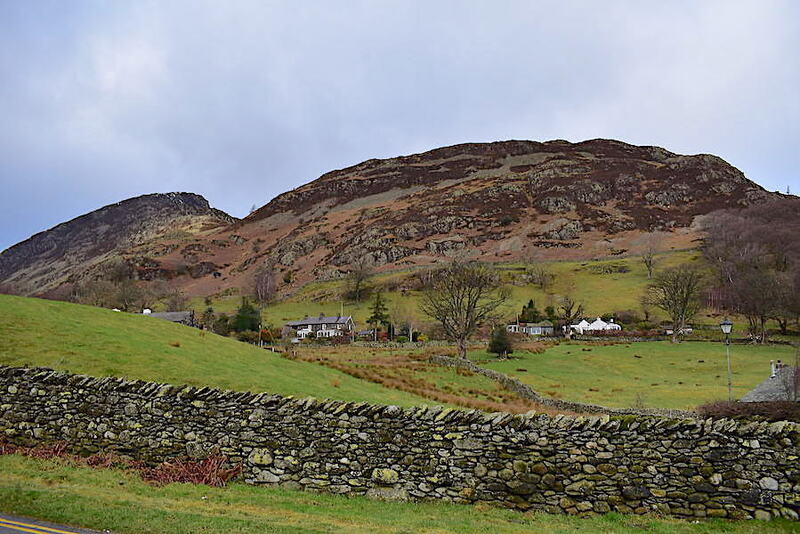 Rounding the first hairpin from where I took a look back along the valley to see Place Fell virtually devoid of snow. 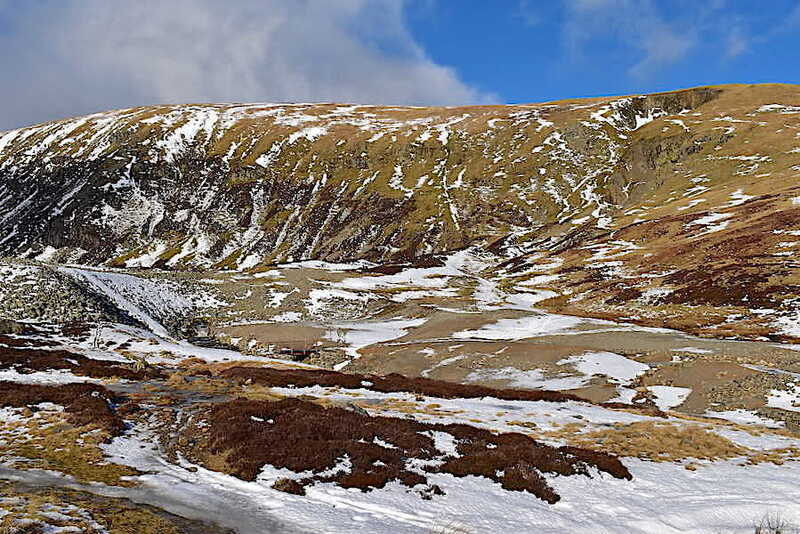 We emerge from the shadow of Birkhouse Moor and, as we reach the shelter of the shrubs at the next hairpin bend, my jacket just has to be removed despite the wind. 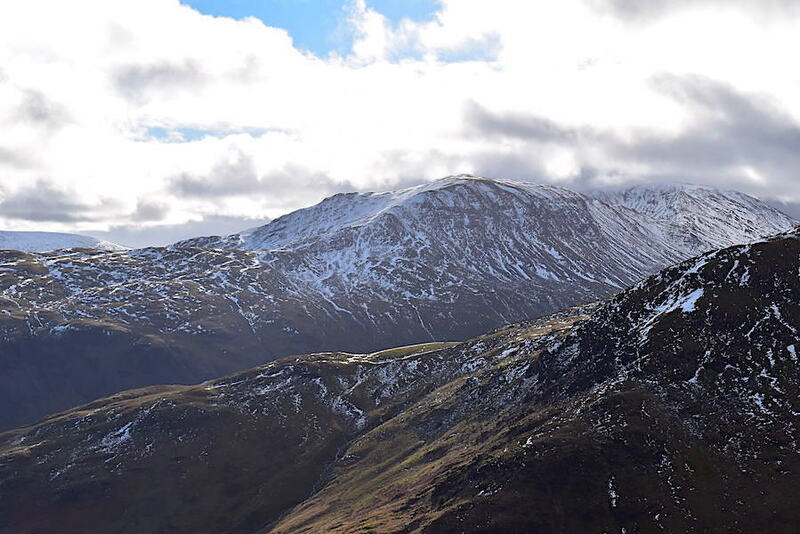 A closer look at Catstycam with the Striding Edge route to Helvellyn just showing on the skyline to the left of it. 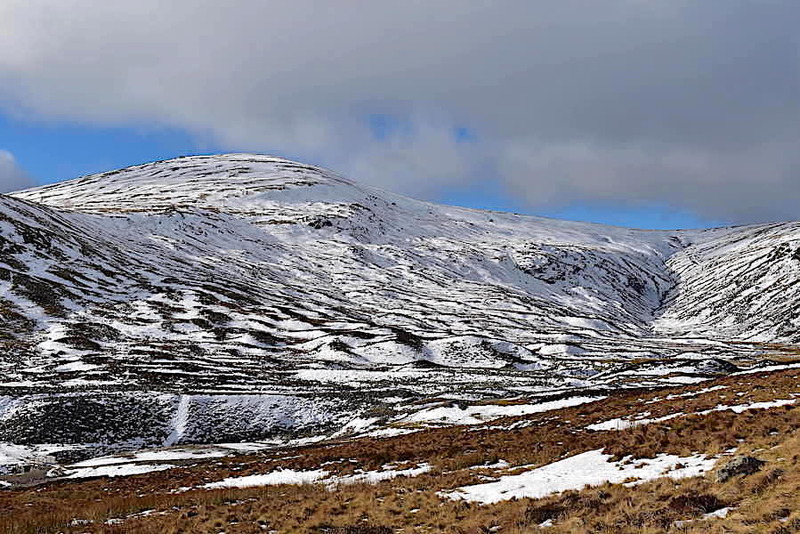 Feeling much more comfortable now without my jacket, and having the bulk of Stang End to shelter us from the wind, we carry on up the zig-zags where the path is a mix of running water, snow drifts and sheet ice remnants. The views open up even more as we round Stang End, with High Street just coming into view over on the far right skyline. We’ve rounded Stang End now and are heading for the bridge across Swart Beck in the spoil heap desert beyond the next rise. Raise on the right skyline as we pick our way over the various humps and bumps. 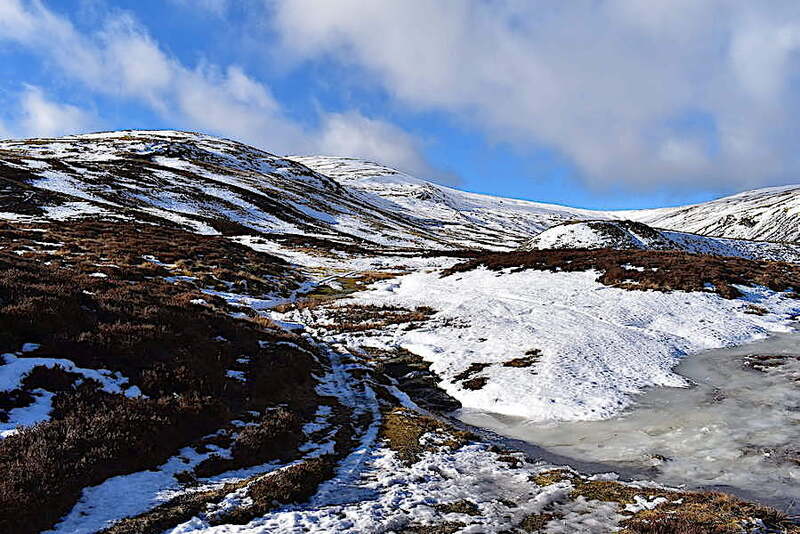 The path was still a mix of water, slush and ice and sometimes it was just a whole lot less fuss to take to the heathery bits, although that occasionally held a surprise as you sank knee deep into an undetected snow filled hollow. 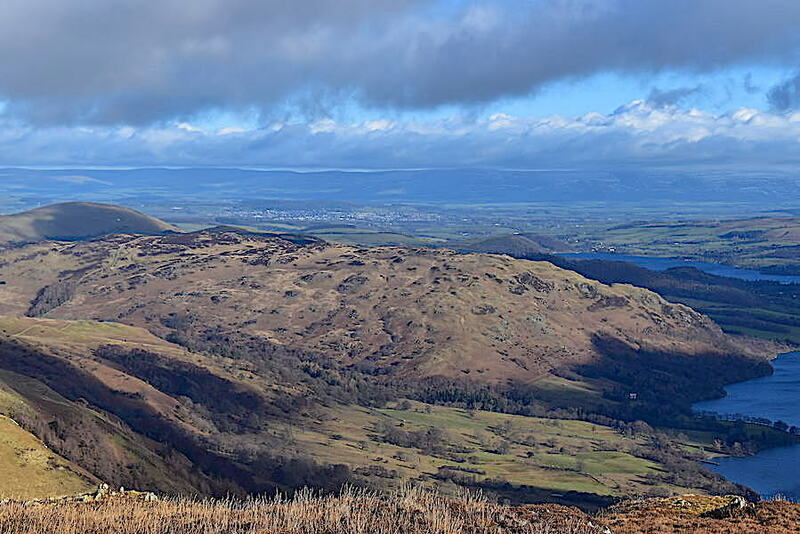 So part two of the forecast came to pass, the clouds gradually broke, the blue sky appeared, and the sun shone through, allowing us a view of the Sticks Pass col with Raise on the left of it and Stybarrow Dodd to the right. Meanwhile the path we’re following is hiding under that large sheet of ice at the bottom right so we negotiate the narrow, muddy and running with water bit just to the left of it. Lots of slurp, slurp under our boots at this point and, just to add to the fun, we’ve got the wind back in our faces again now. After a few more minutes of sinking, slithering and sloshing we gaze down on the spoil heap desert below Green Side, although the sepia tones and slightly psychedelic patchwork below us makes it difficult to work out exactly what is what. Imagine, if you will, the headache of doing a jigsaw based on this shot, it doesn’t bear even thinking about. 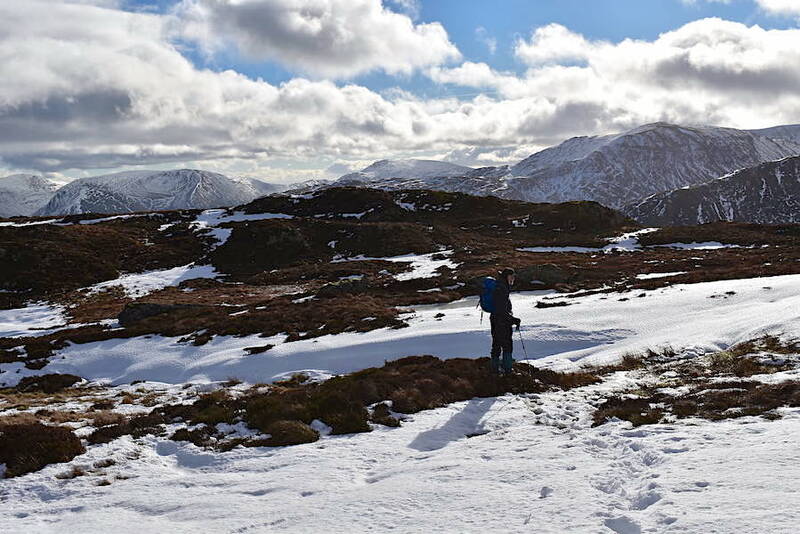 With the wind still blasting across the semi-frozen wastes I need to put my jacket back on so we stop and look for somewhere reasonably firm and dryish to put down my pack, in the process of which I step between two stones and sink in up to my knee once again. I eventually sort myself out and get back into my jacket and, as we’ve already stopped for that purpose, we decide we might as well take a coffee break and I contemplate what’s in store for us across there. The only snow still lying around is filling the various paths and we’ve no idea how deep it will be. 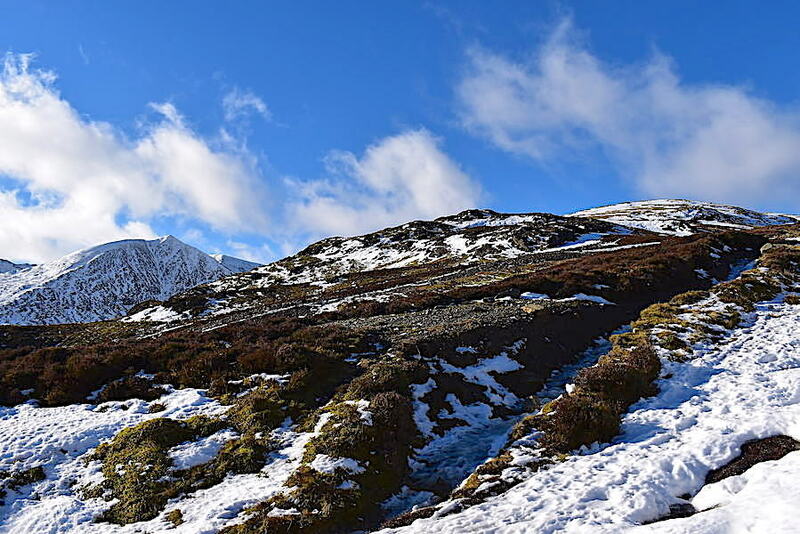 If the paths are full of drifts and we need to bypass them then we can look forward to a very liquid crossing because those slopes have a very moist nature even under normal circumstances. J is contemplating nothing more than his Mars Bar and the view as I accidentally nudge my elbow against a rock and slop coffee all over my trousers! Packs hoisted once again and off we go across the juicy terrain with a look back at Raise to see if there was anybody ski-ing, there wasn’t. 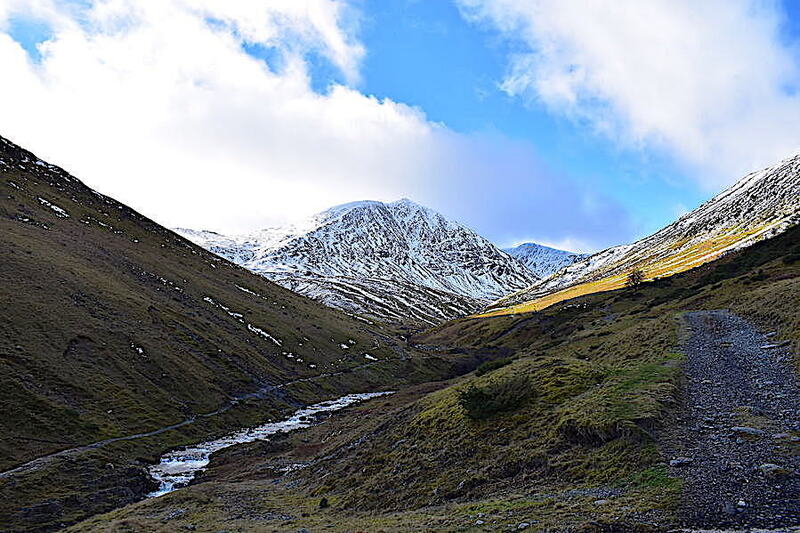 The trek across was pretty much as already described but this grassy slope was snow, mud and water free so it was nice to have firm ground under our feet for a few minutes. 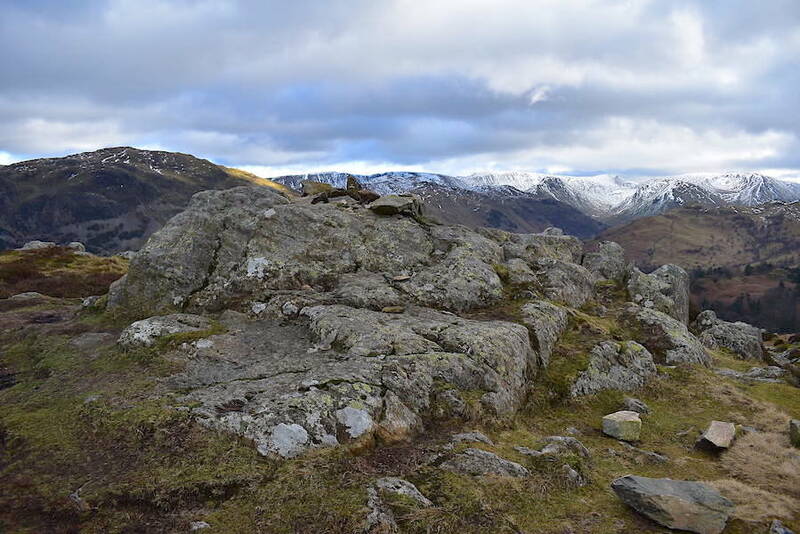 It also gave me the chance to stand still without slithering anywhere and take this look back at Green Side and the head of Glencoyne from the old boundary marker post. 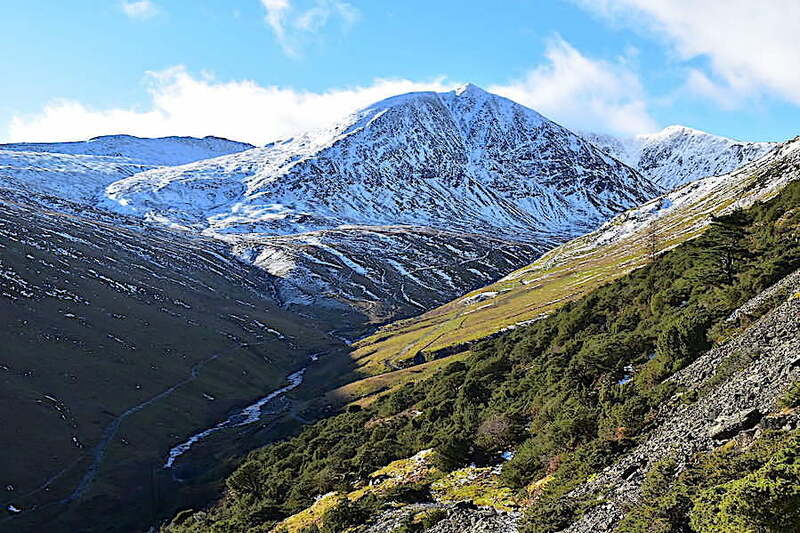 On the opposite side Catstycam always dominates the view but we can see a little of the Swirral Edge route up to Helvellyn just behind it to the right. 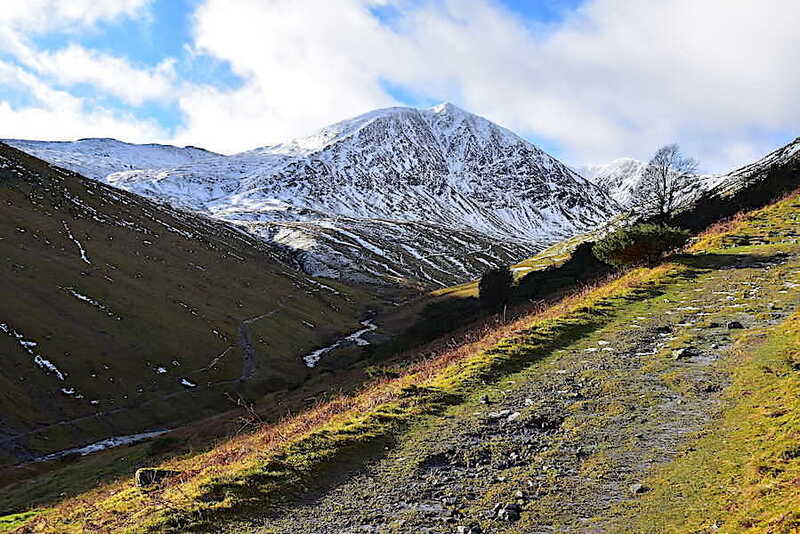 There’s a lot more of the Striding Edge route on view though to the left of it. Still on the firm grassy ground for a look over to Hart Side from the old boundary marker post. The cloud hasn’t quite gone altogether but we’re still enjoying some sunny spells. 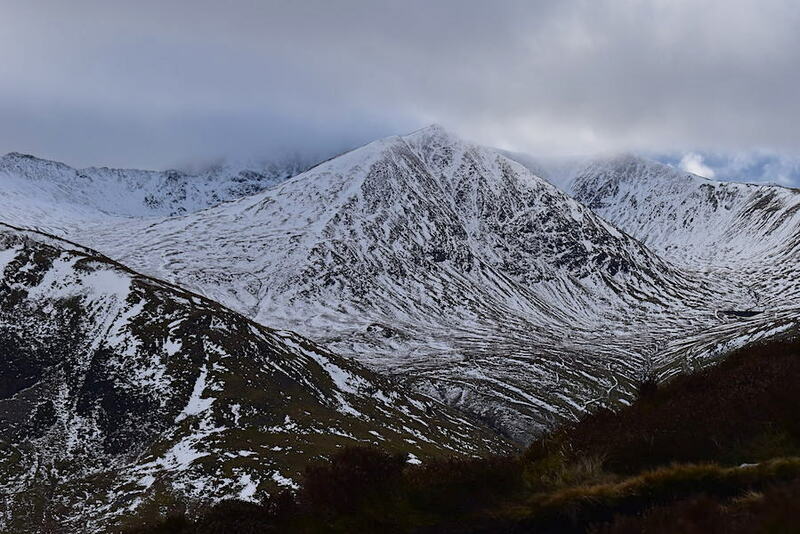 A quick look back to Raise, Sticks Pass and Stybarrow Dodd where the cloud is thickening and the wind speed has increased. Its a bit more useful now though as we have our backs to it and it gives us a helping hand up the slopes. 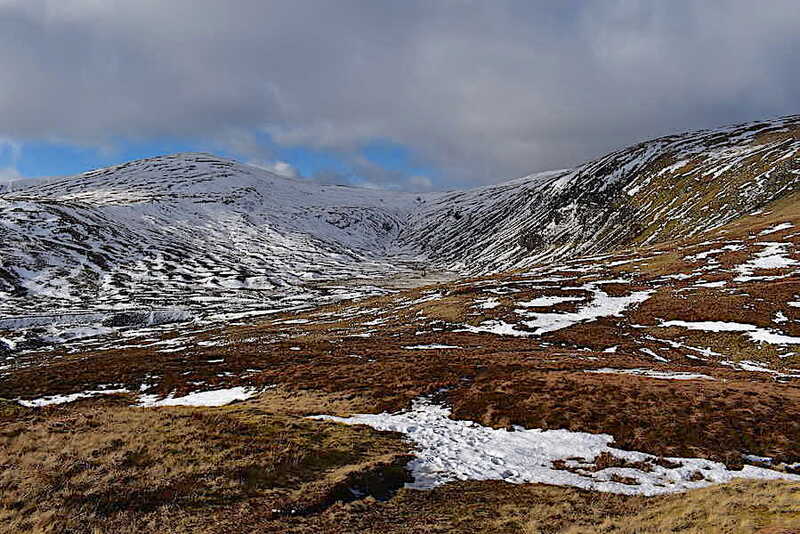 We encountered a variety of conditions underfoot as we walked, wobbled and squelched our way across. 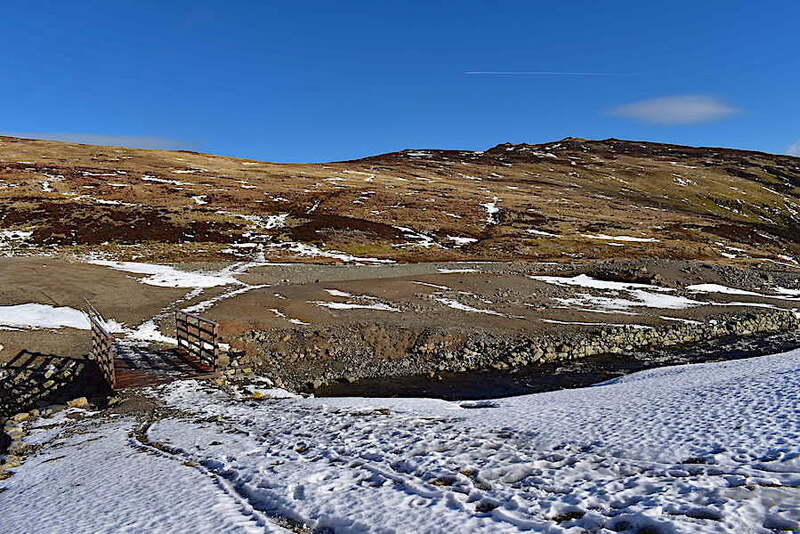 Some parts of the path were well compacted and firm, others were running with water, some had frozen pools or deepish drifts and most of the ground without snow was very, very wet. Occasionally there would be a dry and firm patch, as there was here, but they were few and far between and didn’t last very long either. The gradient isn’t too steep but the ground conditions were trying to say the least. I do hate having to make big detours around clart but I managed not to get too tetchy about it. 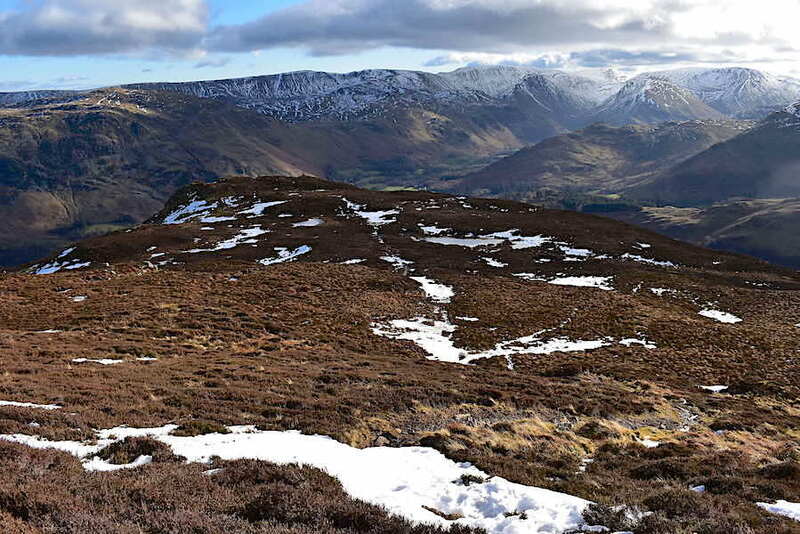 The top of Sheffield Pike is reached with a view down to Gowbarrow, where not a flake of snow is to be seen. I was up to my knees in the stuff in some places when we were over there four days ago. 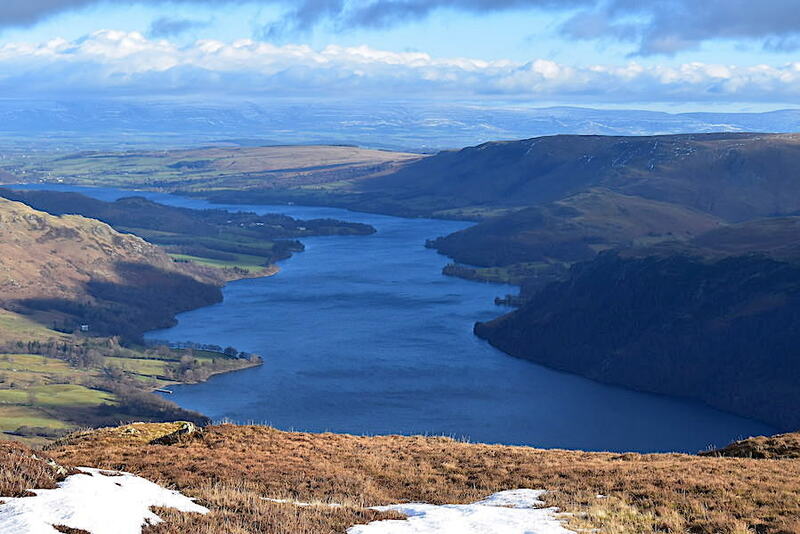 The wind whips up the surface of Ullswater as we gaze down at it from Sheffield Pike summit. It was much too windy for standing around for summit shots and this was the best I could manage. 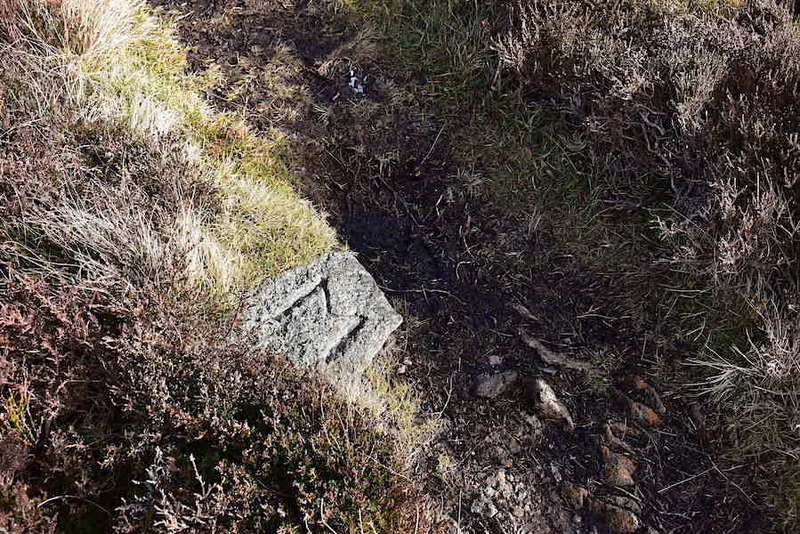 The boundary marker stone, the H indicating land ownership by the Howard Estate of Greystoke, has finally split apart and the conditions were too unpleasant to be rooting around looking for the the piece which has broken off. It’ll still be in there somewhere though. J, unable to tolerate the wind any longer, is taking shelter a few feet below me to the left. The shelter alongside the cairn served no good purpose today, it was full of snow. I dropped down to where J was sheltering to take a look around. 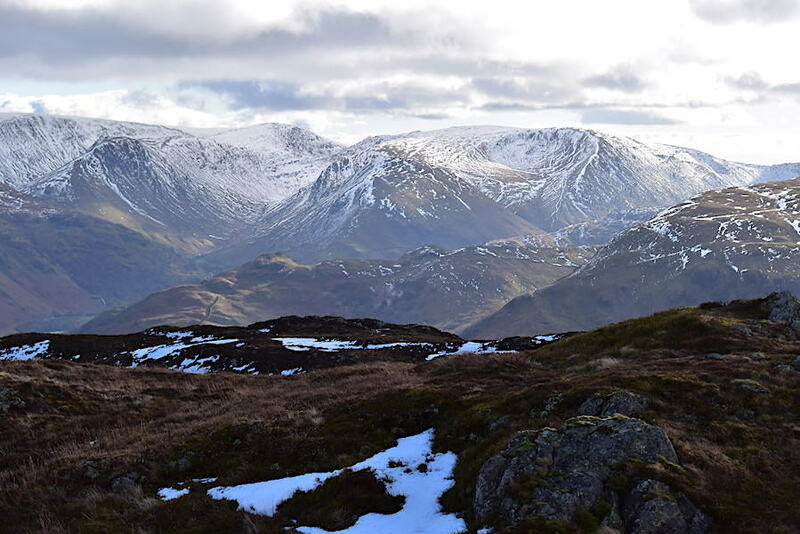 Nearest the camera is Birkhouse Moor, then comes the Birks and Saint Sunday Crag ridge, followed by Red Screes over on the left. 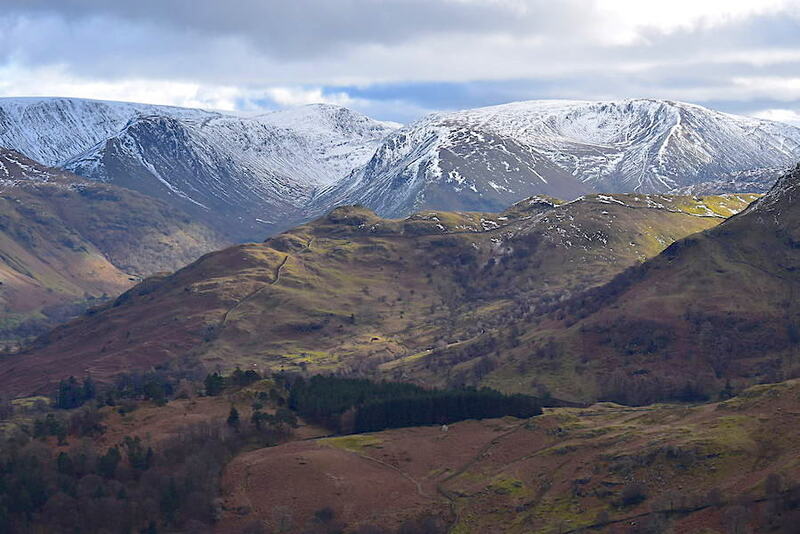 Arnison Crag across the middle foreground with some of the eastern fells behind it. 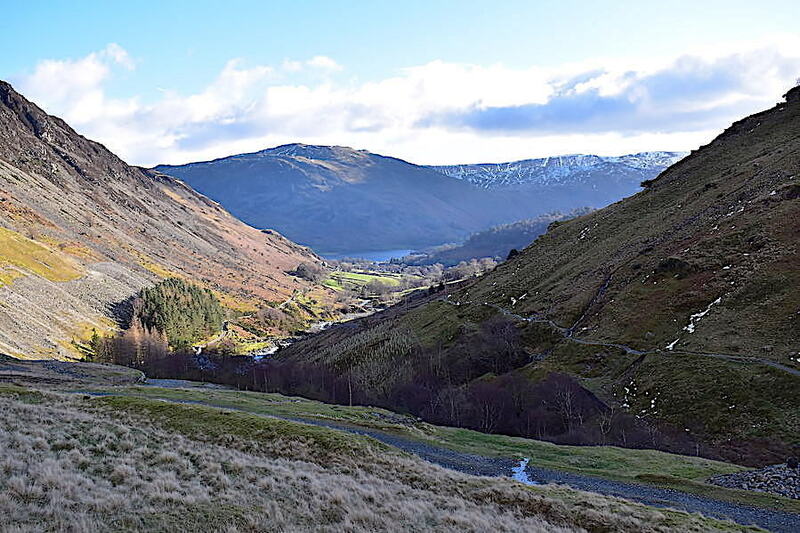 On the skyline, from left to right, are High Street, Thornthwaite Crag and Caudale Moor. 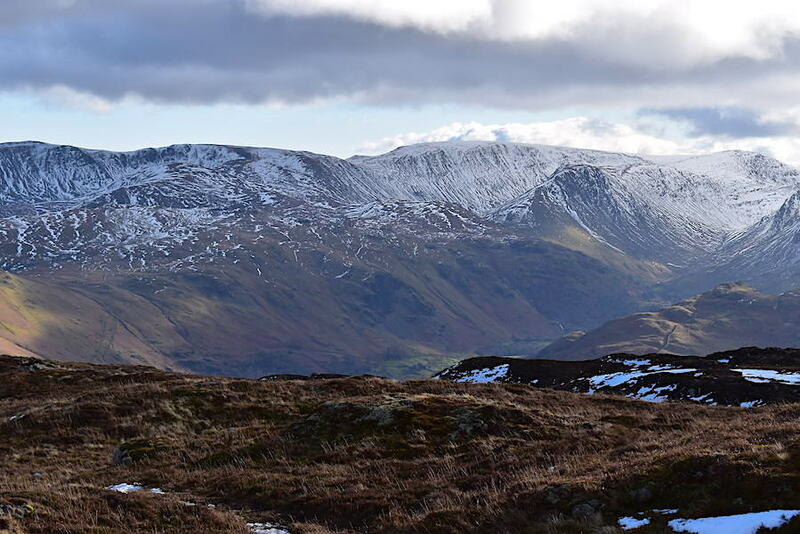 Looking eastward across Patterdale for the skyline view of High Raise, Rampsgill Head, High Street and Thornthwaite Crag. 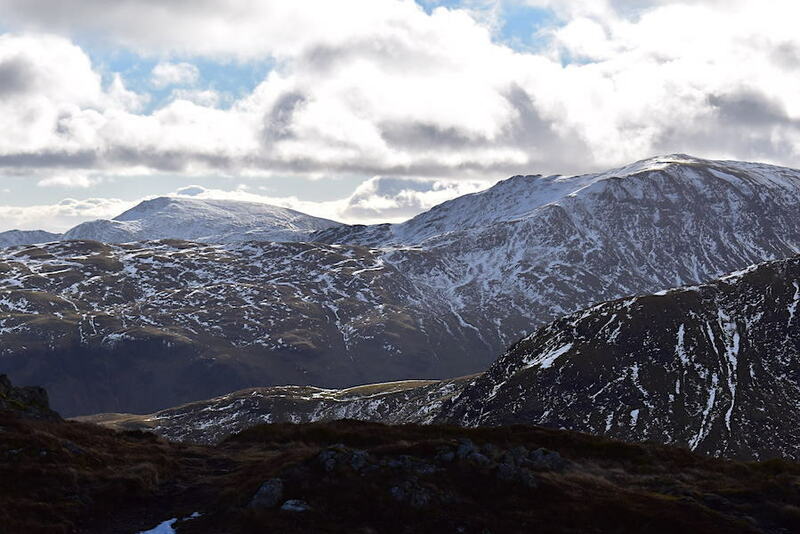 The long ridge from High Raise down to Arthur’s Pike is on the skyline, and just below are Angletarn Pikes, on the left. 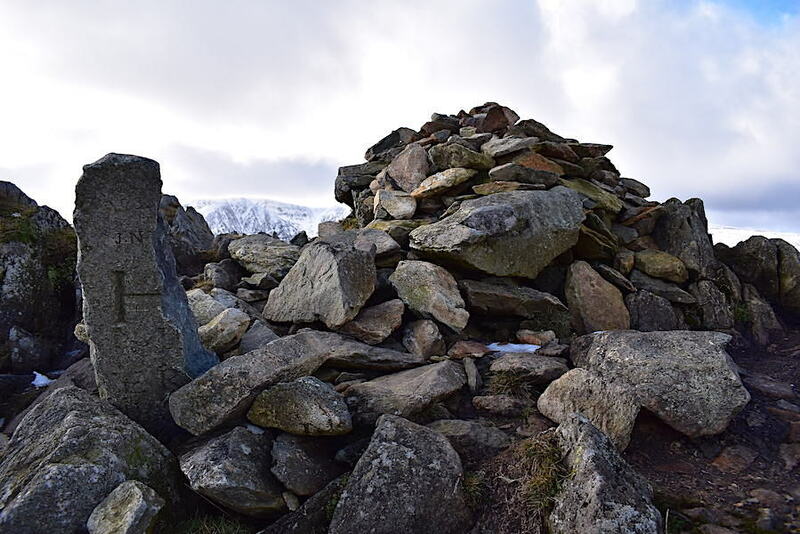 A look back at the summit cairn and boundary marker stone from J’s sheltered sanctuary. Right, time to get off the top and down into somewhere a lot less windy. 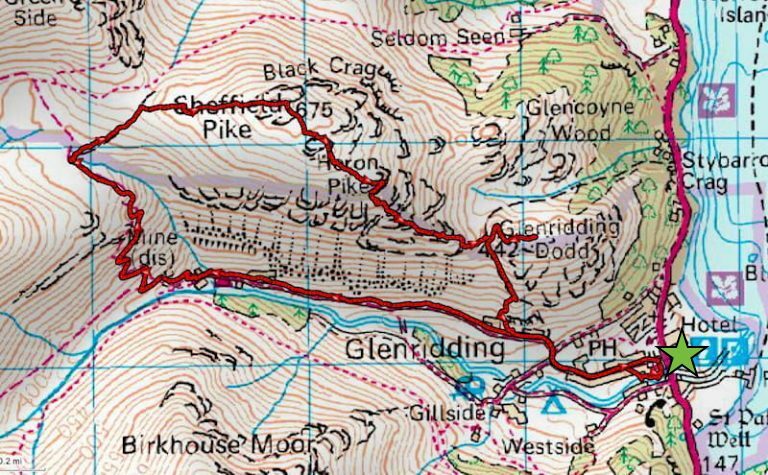 This could be an interesting crossing too, there are lots of wet areas normally across here and its very undulating terrain so who knows what’s in store for us. 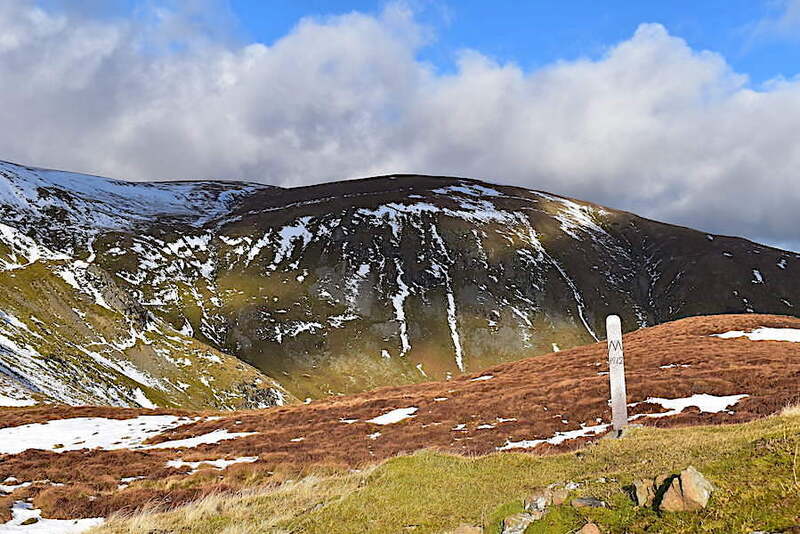 Between this shot, looking towards Heron Pike, and the previous one, we had to do quite a bit of detouring around some of the more unappealing obstacles. 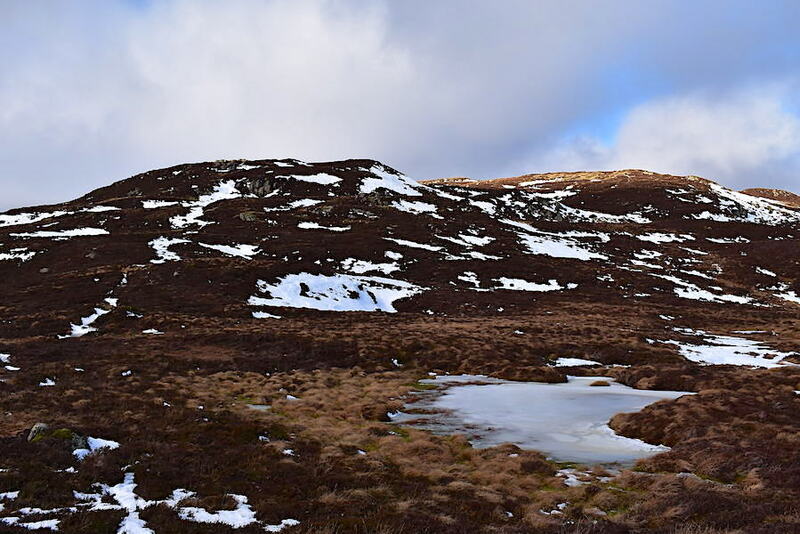 Where there wasn’t any snow the ground was saturated and puddly, and most of the remaining snow was still lying in the hollows of the undulating ground, and, of course, the path disappeared through many of them. During one such detour I managed to sink into a drift, right up to my seat cushions, with both legs now firmly encased in snow. J was a few paces behind me trying to work his way around a soggy patch so he could give me a haul out, but by the time he reached me I’d got myself out. I just flattened myself out on the snow in front of me, to distribute my weight more evenly, then I could lift my legs clear and crawl, crab-like, clear of the hollow. Its not elegant but it does the trick, although its better not to sink in to begin with. Anyway, I’ve gone off-piste so to speak, so back to the walk which, from this point onwards was much more straightforward with less of the path being hidden under deep drifts. 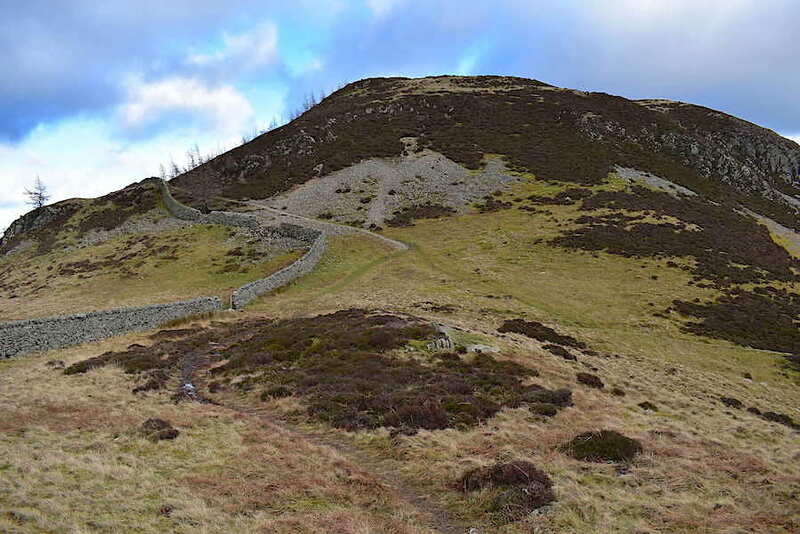 AW didn’t think much of Sheffield Pike as a whole, deeming it to be ‘dismal and cheerless’, but regarding the descent to Heron Pike and Glenridding Dodd he was a little more enthusiastic, noting that it was ‘a rough but pleasant walk with fine views.’ I wouldn’t argue with that opinion. 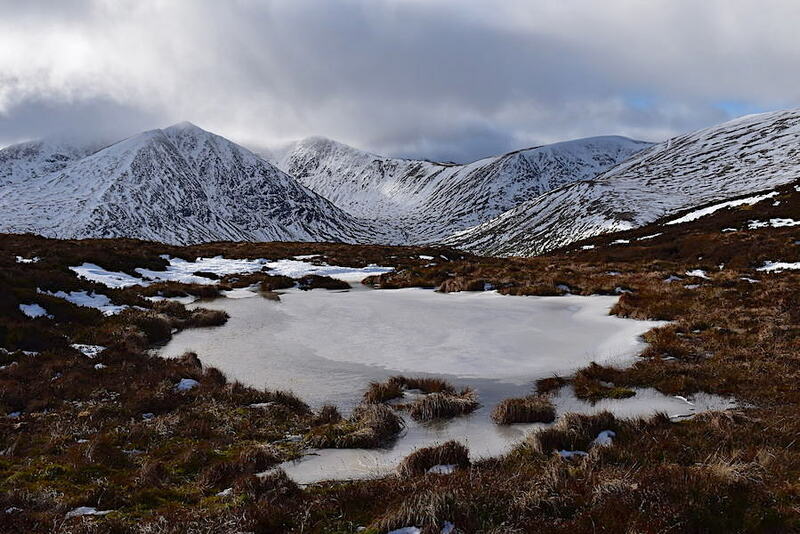 Despite the thaw the couple of bigger tarns across here were still solidly frozen. 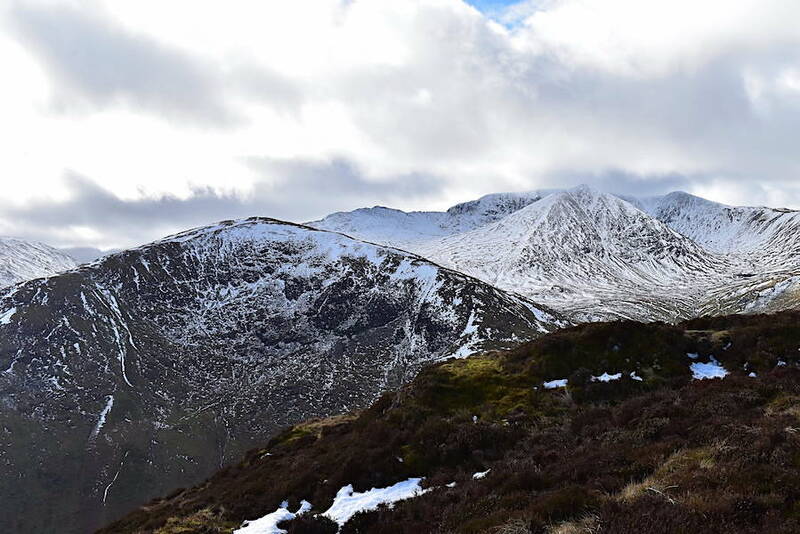 Behind Catstycam, on the left, the cloud has covered the summit of Helvellyn behind it. 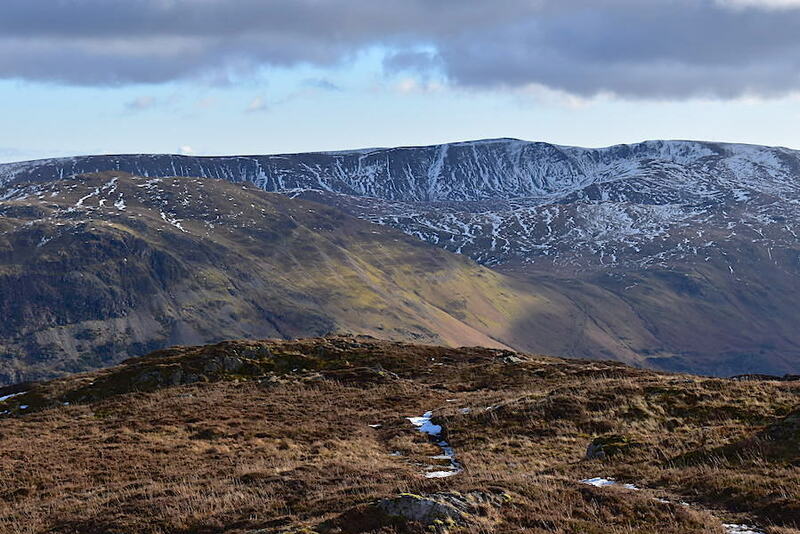 I don’t remember having a clear view of the top of Helvellyn all the time we were out. 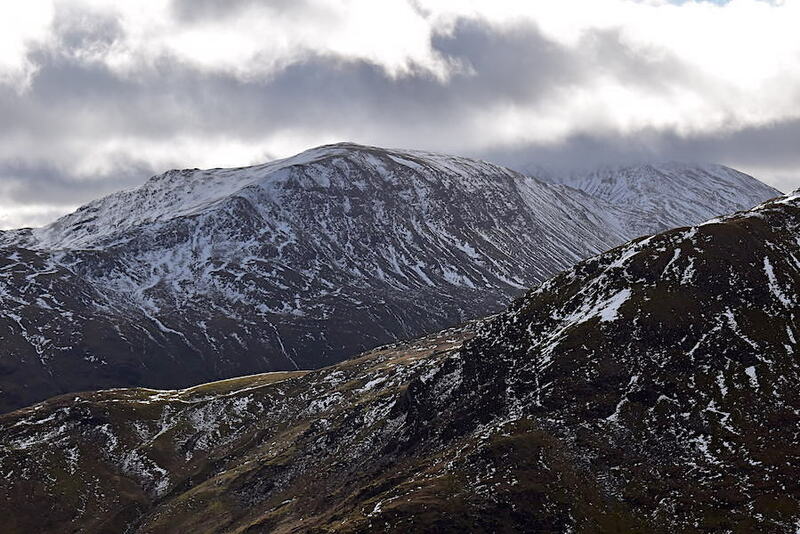 The cloud is also threatening to engulf the top of Helvellyn Lower Man, to the right of Catstycam, and we aren’t getting quite so many sunny spells now. A look back at our descent route from the tarn on the opposite side of the path. 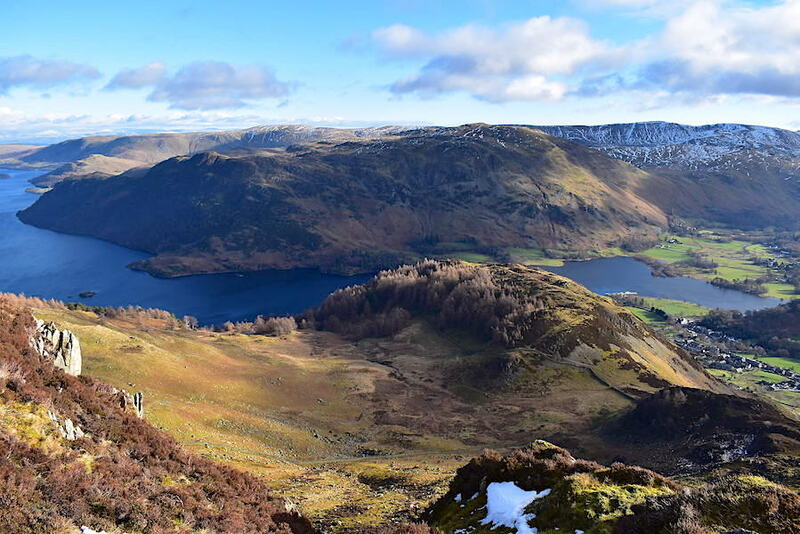 Without any further hiccups we reach Heron Pike with its wonderful view of Ullswater. Even if you’ve seen it several times it still makes one heck of an impact. 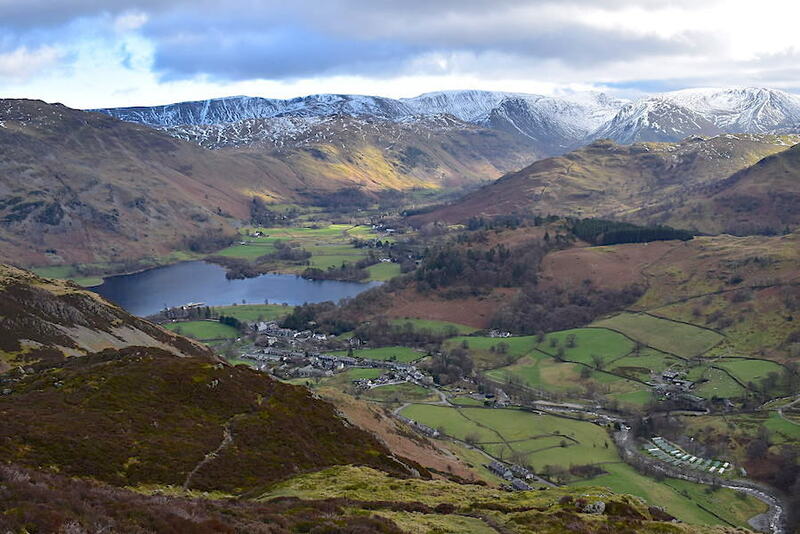 Turning a little to my right and below us is Glenridding Dodd, Glenridding village, the head of Ullswater and the wonderful panorama of fells beyond. 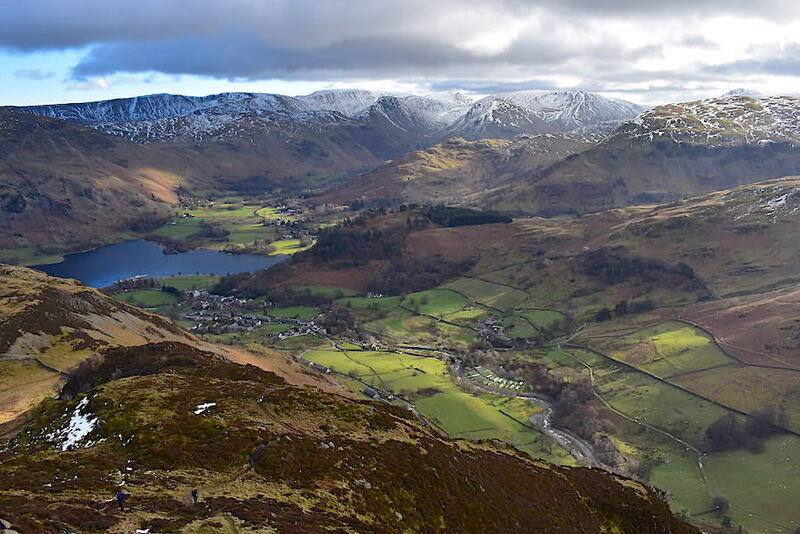 Glenridding Dodd again with Place Fell directly behind it. A good place to stop and break out the sandwiches we thought, so we did. 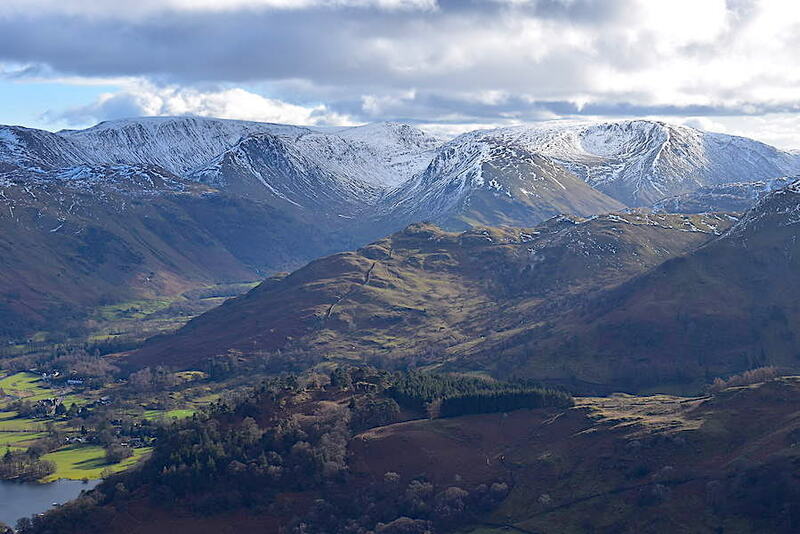 In the centre foreground Arnison Crag receives a splash of sunlight. 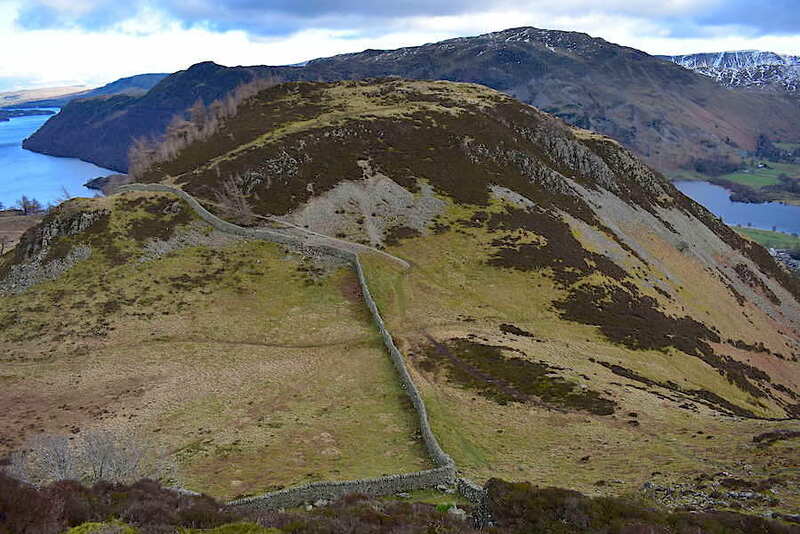 Arnison Crag doesn’t look much from up here, but some parts of the path beside the wall are a whole lot steeper than they look. 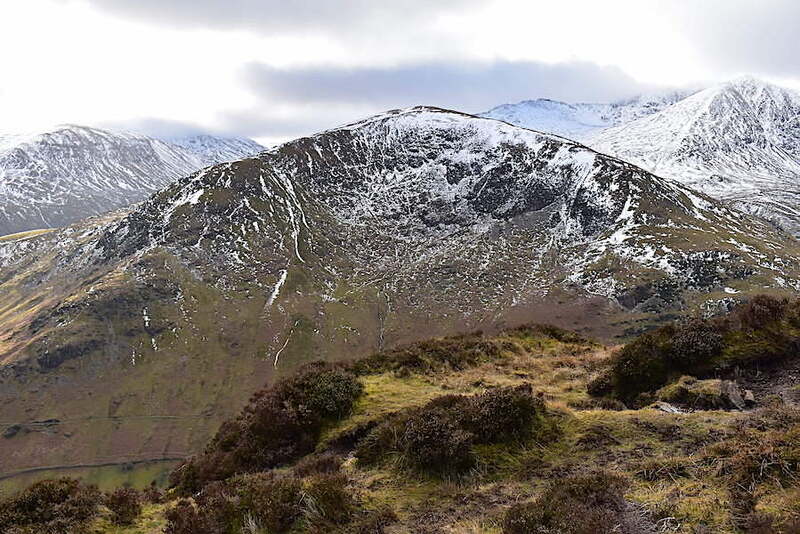 Catstycam has receded into the background now and Birkhouse Moor takes pole position. 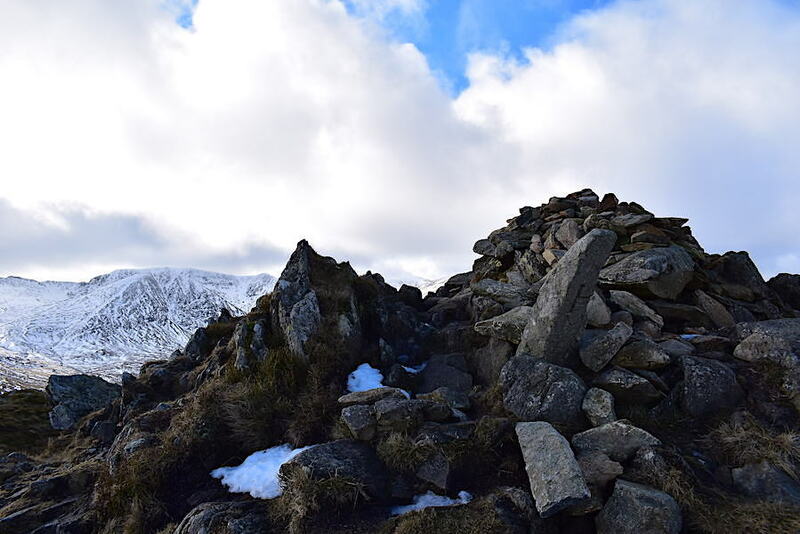 Cloud is still clipping the summit of Helvellyn …..
….. and the top of Fairfield, on the right skyline, gets the same treatment, while Saint Sunday Crag and Gavel Pike remain in the clear. Part of one of the old boundary stones embedded into the side of the path as we make our way off Heron Pike. The M indicating land ownership by the Marshall Estate of Patterdale. 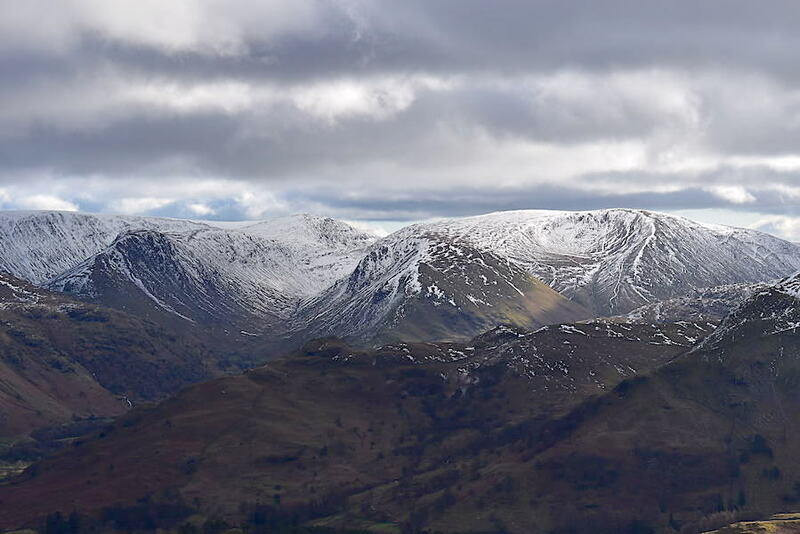 The cloud thickens and lowers over Helvellyn and Helvellyn Lower Man…..
….. and a good part of Fairfield. 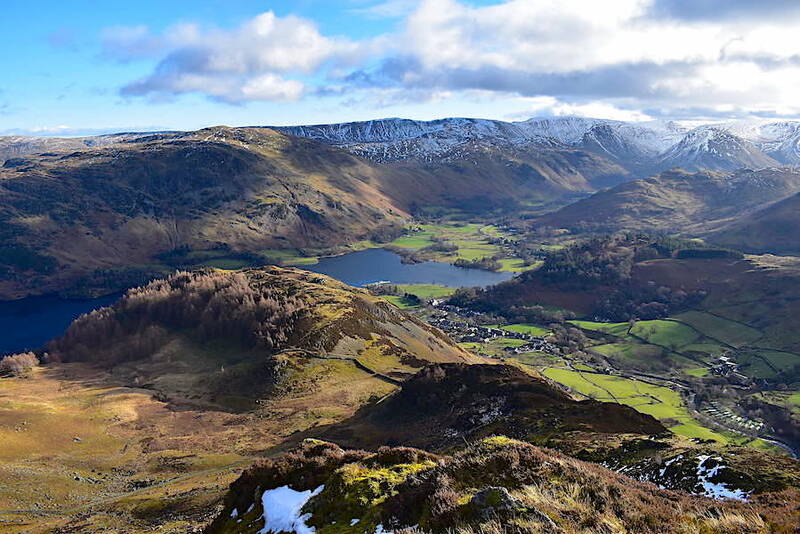 Still clear on Saint Sunday Crag though. 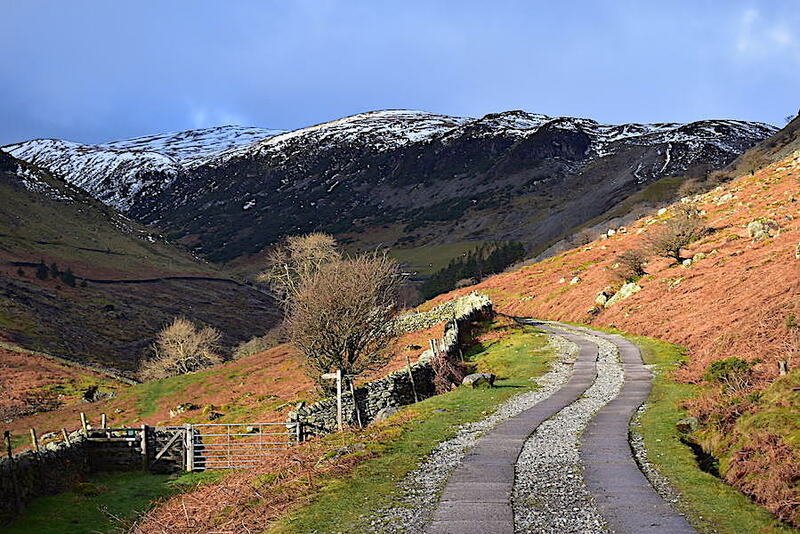 Still getting some light on the skyline are High Street, Thornthwaite Crag and Caudale Moor. 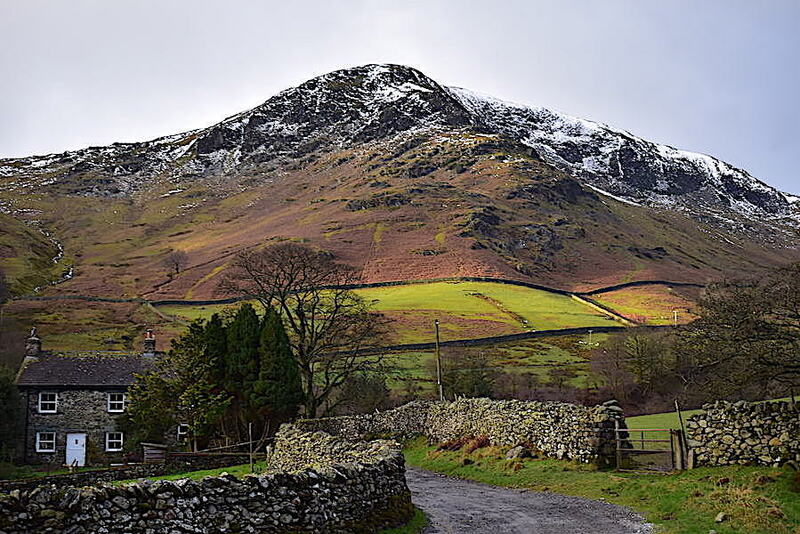 The two prominent fells below are Gray Crag and Hartsop Dodd, left and right respectively, and between the two is the valley of Pasture Bottom. We’re all grown-ups now, so no sniggering on the back row. Birkhouse Moor just begging to be photographed, so I obliged. 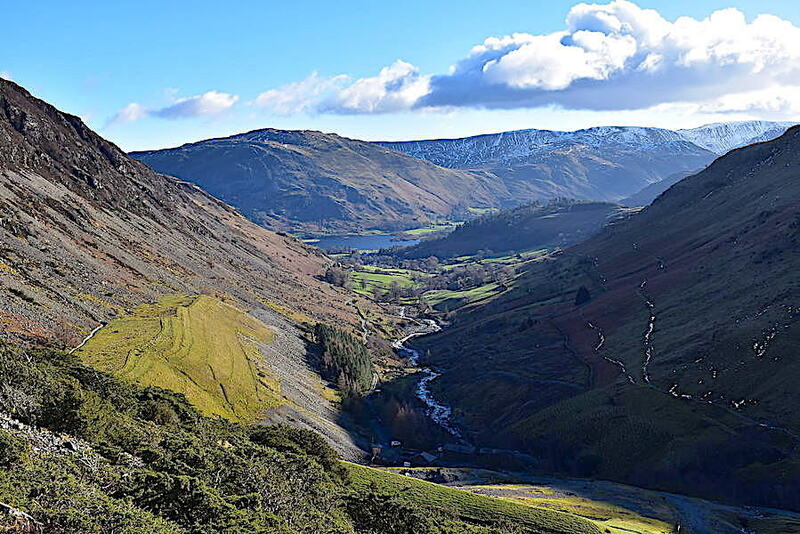 Little glints of sunlight brighten the fields around Glenridding, and below us on the path to the left you may be able to pick out a pair of walkers making their way up towards us. They are the first ones we’ve seen so far. The camera says its level but my eyes are not convinced. Its still a nice view though. Still descending and heading for the path through the heather below us. Not much snow or ice down here so we didn’t have too many awkward bits to deal with. It is rocky though and care needs to be taken. 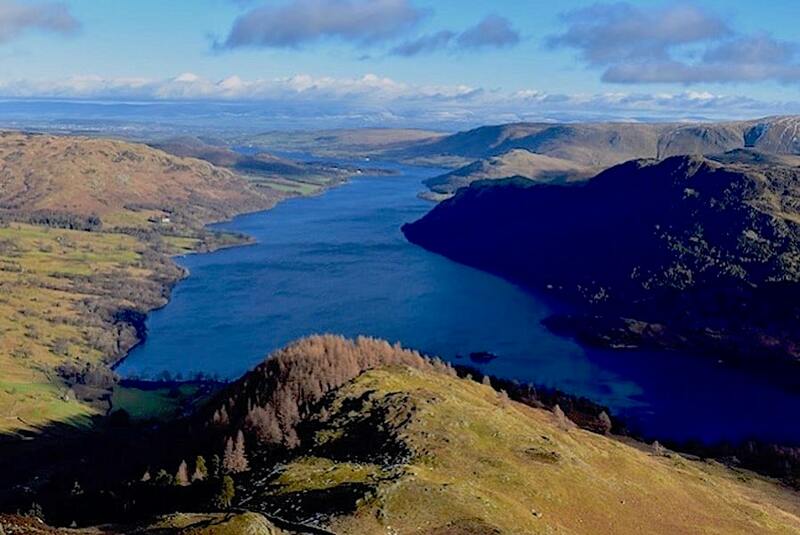 The views are magnificent and its a very enjoyable part of the walk. 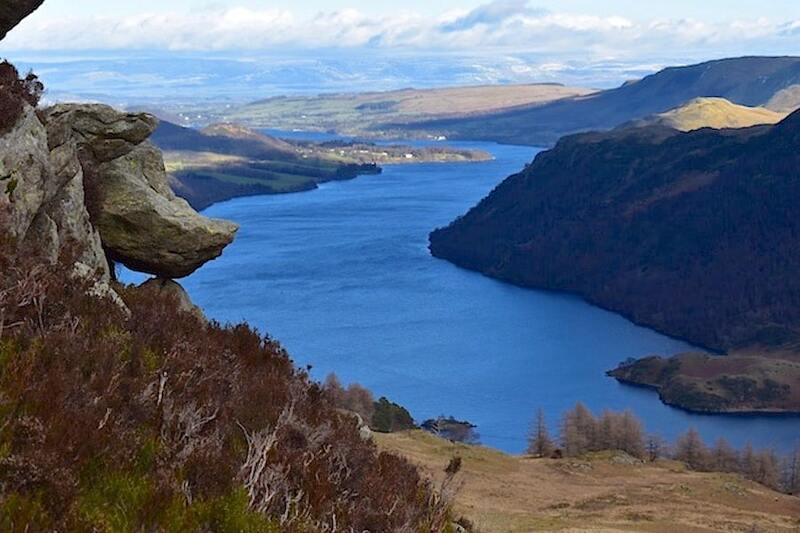 ….. and another view of Ullswater from the ‘rhino rock’ with its neighbour ‘the shark’ right next to it. 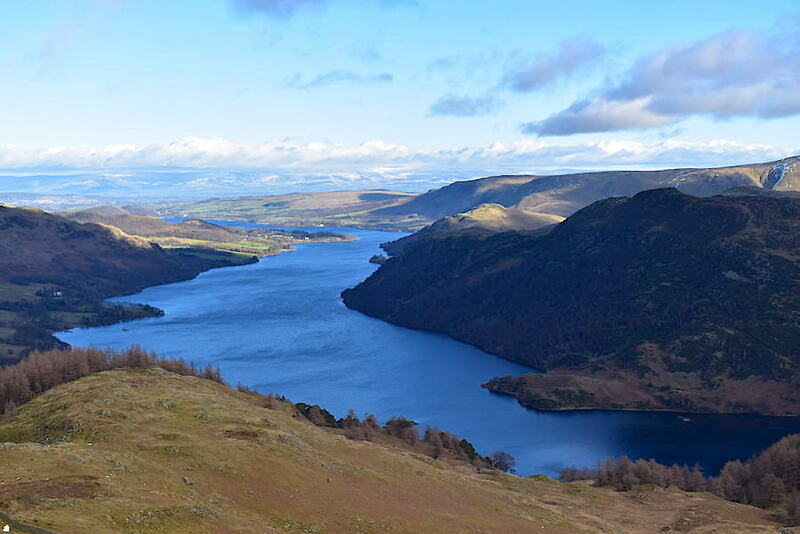 I still think Ullswater is on the slant. 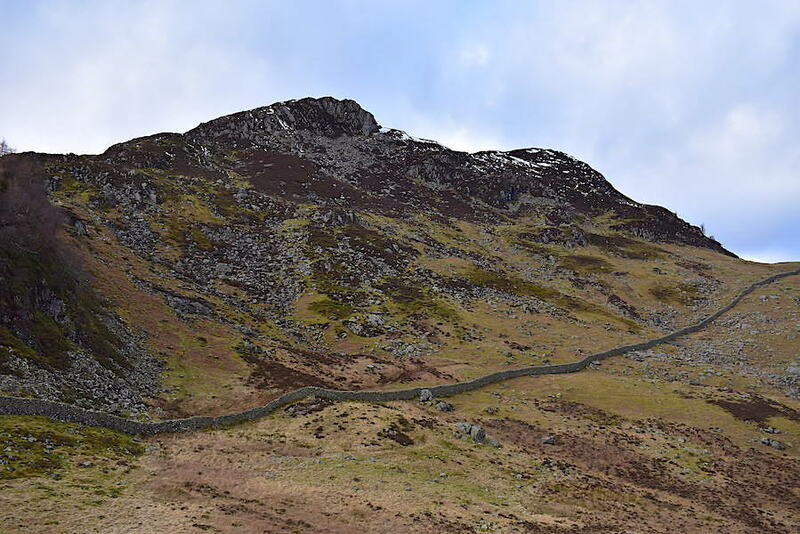 A view of the route up onto Glenridding Dodd, we’ll go down to the wall, take the path alongside it, bear left, then right, then straight ahead and there you are, on the top of it. The lone tree is still clinging on although it does have a big rock to lean against. I could do with a lean against something right now because I’m beginning to feel an ache on the right side of my back. Its only a consequence of the constant stepping down over the uneven ground during the descent, but it will be good to stand for a few minutes on the level ground down there. Back on terra firma once again and the bliss of dry ground where I can stand and give my back niggle a chance to stop complaining. 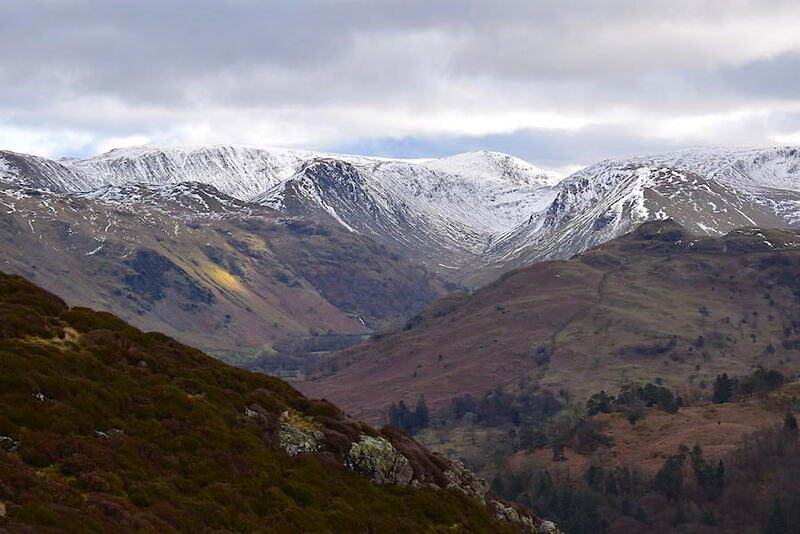 A look back to Heron Pike as we start to climb up Glenridding Dodd …..
….. and a look over to my right where the cloud has thickened even more allowing just the one beam of sunlight to land on the lower slopes of Brock Crags. 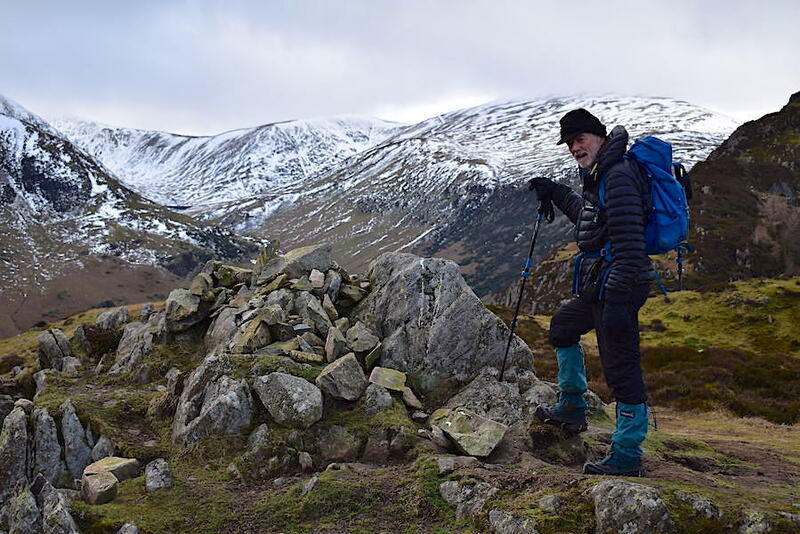 No blue skies over Birkhouse Moor and Raise now as I persuade J to pose for a summit shot. He’s happy to oblige because he’s not standing in a howling wind any more. 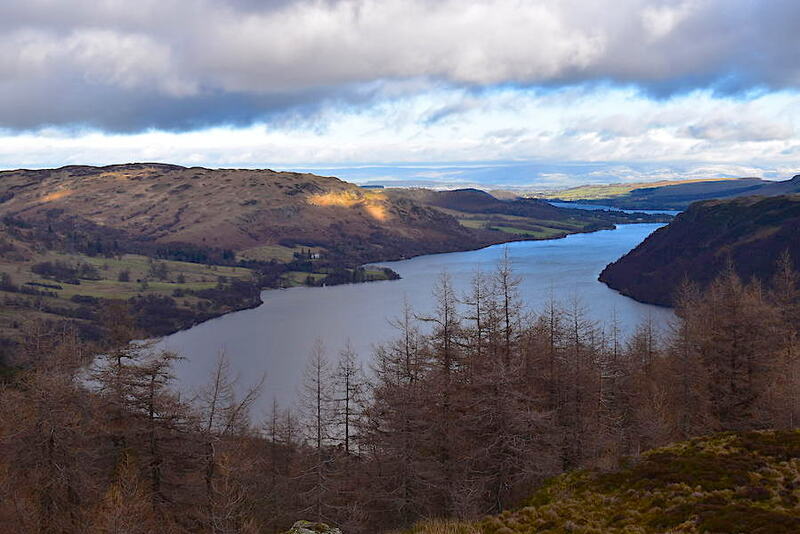 Ullswater again from Glenridding Dodd, and another spotlight landing on Gowbarrow. The camera says the shot is level and I’m pleased to say that I now agree with it. 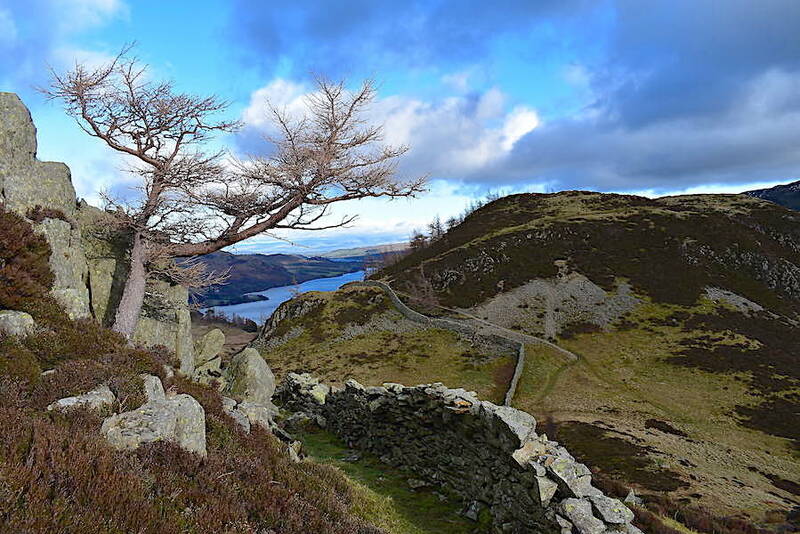 There are certain views of Haweswater that I have the same problem with so it must be something to do with the lay of the land deceiving the eye. Heron Pike again with the summit of Sheffield Pike set well back behind it. 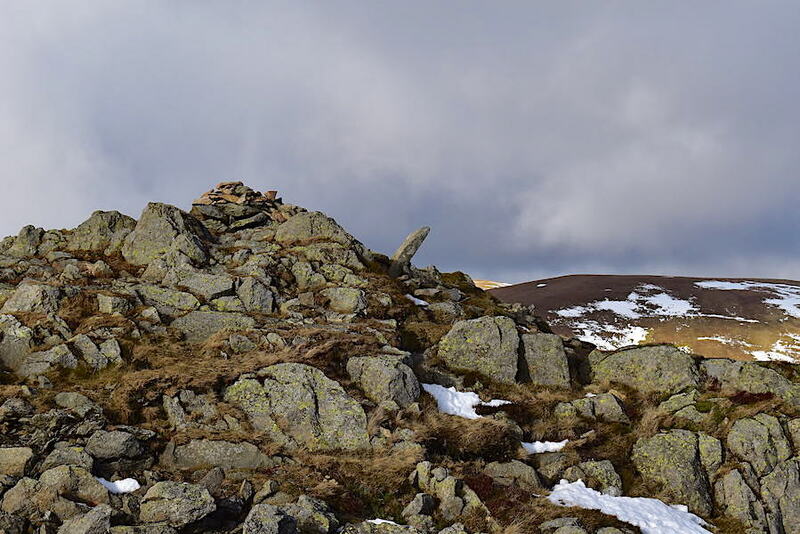 No splendid cairn, just a few stones placed on this outcrop of rock to mark the summit. 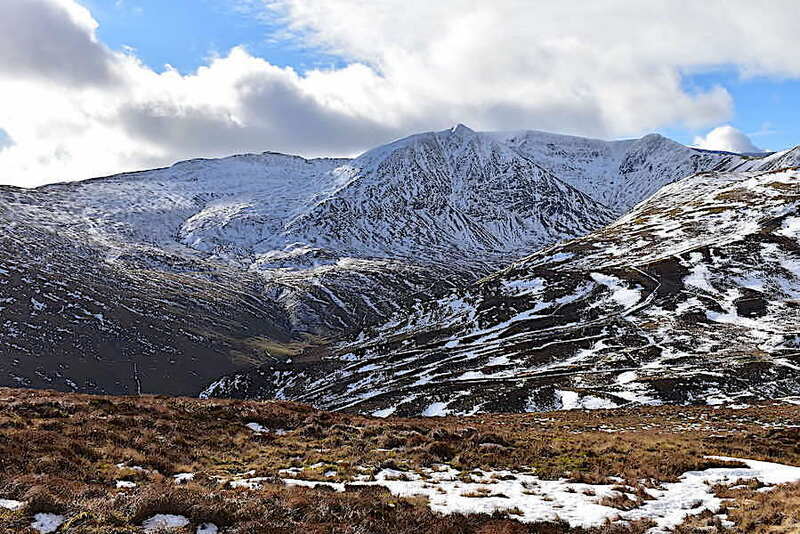 We make our way down from the top, via The Rake, back to the Greenside Road and emerge just beside the cottages, from where its only a short walk back to the car. So that’s the end of our walk today. Its been a good day, especially as we weren’t expecting to be walking today, and it was great to be out again. The earlier sunshine more than made up for the gusty wind and the overall wetness. We are both a bit bedraggled, looking like something the cat just dragged in, and our gaiters are soaked and mud spattered, so its time to hotfoot it back to the car, peel them off and get off home for a cuppa. See you soon.